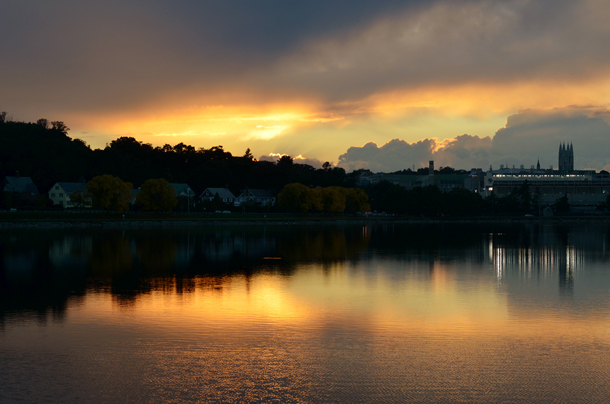 Sunset on Chestnut Hill Reservoir. Oct 2012. Eat dinner together as a family on most nights. No TV. No cellphones. No distractions. Drink alcohol only 3 nights a week (I've gotten a little too comfortable with the nightly adult beverages). Complete the Whole30 program within the next six months. Read 10 books this year with at least 3 being nonfiction. Be an example to my little sponge of a daughter. No bickering, fighting or swearing while her ears are listening. And maybe no bickering or fighting in general (swearing OK :). Delete my Facebook account. Focus on building genuine and sustaining friendships. When fed up in my role as a mom, remember that this little human is learning how to react and behave based on how I react and behave. Enjoy this emotional and curious and limit-testing stage in her life. Dates with Lee at least twice a month. Runs. Bike rides. Drinks. Movies. Dinners. And finally... Let loose of what I can't control. Serenity will be mine. Tell me. What is one of your resolutions? P.S. Looking back... 2013. 2012. 2011. Weekly Workouts: Monday - CrossFit Edmonton! 2 minute AMRAP double-unders (84), then reps of 10-8-6-4-2 of deadlifts (125lbs) + box jumps (20 inches) with a sled drag between sets (65lbs). Then 10 sets of 3 push press at 75% of 1-rep max (85lbs), then 50 ab-mat sit-ups. Tuesday - Easy day at the pool with 10 minutes of treading water + 8 stair climbs to the indoor slide. Wednesday - Happy New Year with a rest day! Thursday - Run! 6.8 miles/59 minutes. Friday - TRX + push-ups and sit-ups (TBD). I also deleted my Facebook account a little before Christmas. One of my resolutions is to join The Junior League or a tennis league to meet new people. Another is to squat 230lbs by the end of the year -eek! I love this resolution list. Call me a cynic, but frankly most make me want to cringe or roll my eyes. #1 is high on my list as well. A couple years ago Devon and I bought a table from Ikea that collapses to take up only about a foot of space... unfortunately that's how it's stayed with the exception of very rare dinner guests. Looking to make family breakfasts and dinners at that thing a regular occurrence. Good luck with three nights a week. That sounds achievable. I also have to admit that i put Facebook back on my iPhone! I just needed it when we were in hospital!